Can you keep Apple Music Songs after the Trial? Apple Music is a subscription service which allows you to listen to any music at anytime. You can even download music from Apple Music to your iTunes library. However, if you are to cancel your subscription, or your free trial ends, any music that you downloaded through Apple Music will be removed from your library. Tune Sweeper makes it easy to identify songs added to your library by Apple Music. These tracks will disappear from your iTunes library, if you cancel your Apple Music subscription. If you like to discover new music, Apple Music is a great, easy way to do it. It allows you to listen to most tracks in the iTunes store for the price of a single monthly subscription. 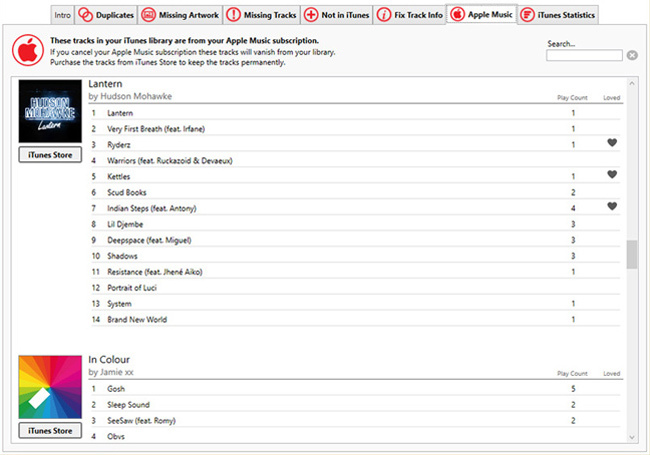 You can even select any track or album from the iTunes Store and add it directly to your music library. When you add music to your library – it seamlessly merges Apple Music tracks with the rest of your music. The music appears as part of your regular music collection. However, if you cancel your Apple Music subscription, all of your music added using Apple Music will vanish from your iTunes library. When you click the "Apple Music" tab in Tune Sweeper, the program will automatically list all of the music in your current iTunes library which has been added using Apple Music. If you should cancel your Apple Music subscription, these tracks will no longer be visible or available in your iTunes library. The tracks will be organised under their album. You can search for specific tracks or albums using the search box in the top-right corner of Tune Sweeper. If you are planning on cancelling your Apple Music subscription, and would like to keep your Apple Music tracks in your library, Tune Sweeper can help. As well as identifying which tracks are from Apple Music, Tune Sweeper also provides a handy link, for each album, to the relevant iTunes Store page. From here, you'll be able to purchase the album or tracks that you want, and they will stay in your iTunes Library, even after you cancel your Apple Music subscription!